Danny spent 2005 through 2008 coaching and training youth soccer in Rio de Janeiro, Brazil. 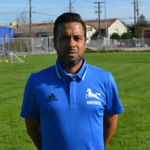 His U.S. soccer coaching experience includes eight years as a women’s college coach, eight years as high school coach, and more than a decade of experience as a coach/trainer at the Division 1 youth club level. Danny’s playing experience includes varsity soccer at Chico State University as well as becoming a professional player. Danny "has the passion for the development of players and teams, by creating a caring, positive, and respectful environment." Danny holds an E/D coaching license as well as numerous other coaching and training certifications.